HONG KONG, China, August 8, 2012 (ENS) – Containers full of plastic pellets swept from a ship during Typhoon Vicente last month have broken open, scattering the pellets at sea and on at least 10 Hong Kong beaches. Overnight on July 23-24, in the worst storm to strike Hong Kong in more than a decade, the cargo ship Yong Xin Jie 1 lost seven 40-foot-long containers in the waters south of Hong Kong. Six of the containers contained sacks of small plastic pellets used in the manufacture of other plastic products, about 150 tonnes in total, according to Hong Kong environmental authorities. Five of the containers full of plastic pellets were located by the Hong Kong Marine Department, which salvaged the containers and the plastic pellets at sea. 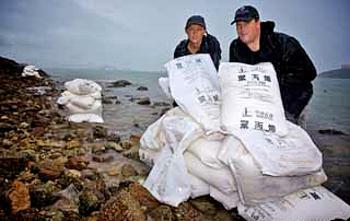 About 50 tonnes of pellets in 25kg plastic sacks have been collected from the water. So far, about 21 tonnes of the plastic pellets that washed ashore also have been cleared. Together with those collected by the Marine Department, about half of the spilled pellets have been collected, said Hong Kong Secretary for the Environment Wong Kam-sing. The government now says it will send the tonnes of spilled pellets to a recycler instead of dumping them in landfills where an undisclosed amount of those collected to date have ended up. Environment officials at first said it would be tough to recycle the pellets because they were mixed with sand or trash. Hong Kong Secretary for the Environment Wong Kam-sing (second right) and Dr. So Ping-man talk to cleanup volunteers at Sam Pak Wan beach, August 5, 2012. 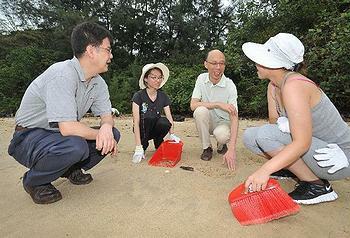 Wong inspected the contaminated beaches on Sunday with Dr. So Ping-man, assistant director of the Agriculture, Fisheries and Conservation Department. Wong said that upon receiving reports of the plastics spill, four government departments took immediate action on air, sea and land. To date, they have tracked the locations of the pellets, assessed the risk to food safety and marine ecology, and conducted clean up and salvage work. Wong said government officials have discussed with relevant parties, including green groups, how to deal with the situation. He said officials now will hire more people to speed the clean-up operation and keep close contact with green groups and the local community. Painstakingly, using brushes and dustpans, hundreds of volunteers worked all weekend on residential Lamma Island, south of the city center, where two beaches are covered with the pellets. Volunteers are also trying to clean Sam Pak Wan beach in Discovery Bay on Lantau Island. The plastic pellets are not toxic, so water quality has not been affected, said Wong. Still, the agency advised the public not to eat any dead fish found on the beach or fish with any abnormal appearance, smell or taste. Gary Stokes of the nonprofit organization Sea Shepherd Hong Kong is working with local authorities on the cleanup operation. He warns that when the pellets, known as nurdles, absorb pollutants, they turn yellowish brown and become toxic to marine life. The Food and Health Bureau says it will step up safety monitoring for fish caught in local waters, as well as farmed fish raised in the vicinity of the plastic spill. The government said Monday that the cleanup could take months. The Marine Department will continue helicopter searches, step up patrols along the coastline and arrange reinforcement from other districts to tackle the incident. 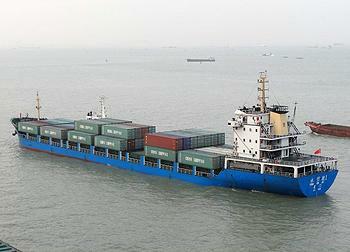 The Xiamen-registered vessel was leased to shipping agent China Shipping Container Lines. The ship owner conducted a helicopter search along the Hong Kong coastline to look for stranded or floating containers and plastic pellets. Vessels are urged to make reports on sighting of the missing containers through their existing reporting system. Information has been passed to the Mainland maritime authorities in the neighboring region so that they are aware of the incident and will report any sightings of the missing containers.